This one shows up beautifully on the white and is visible on the black. More than I expected it to. For some reason I actually prefer this over the black than the white. The image transferred very well on the black but on the white it seemed a little patchy so I think the black base is just a little more forgiving. It seems to stamp really well on the thinner lines but it is one I will try again in future to see if I can get good stamping. Ah this polish is gorgeous. It shows up beautifully on the white and the black but of course the holo really only shines on the black. For some reason my ring finger looks a bit smudged but all in all it stamped pretty well. 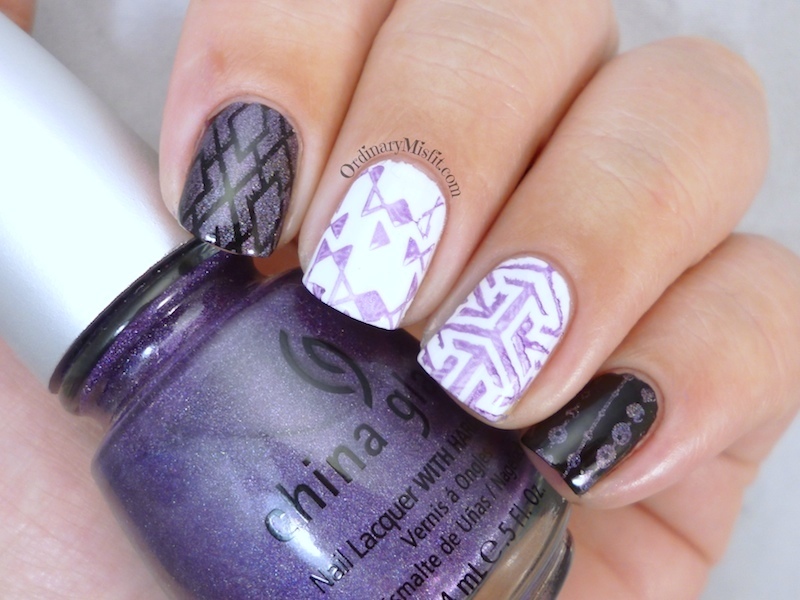 I did have a Color Club – Eternal beauty (a purple holo) before and I think that one stamps better. You can see it here or under the “swatches” tab above. Anyway, it stamped ok. In my case I have another holo that stamps better but if you don’t then I do think this one is workable. I mean for me my index is perfect! I want to make an observation about stampers so keep a look out for that at the end. Amethyst shows up really well on the white and also quite well on the black. Again, except for my ring finger it stamped really well. It’s one of the better ones so far. Definitely one that is workable and I will try again. In this case I once again prefer the stamping over black than the white even though it does show up really well on the white. The stamping just doesn’t look as patchy on the black. Fig also seems to have a bit of a metallicy look on the black. I don’t know if I will give this another shot. Ok so I mentioned the stamper earlier in this post. Since I started these posts I have accumulated a few different stampers. I started off with the Essence stamper that worked absolutely fine for me. I then started hearing about different types of stampers like squishy, squishy soft, squishy firm, xl etc. I picked up a different stamper from Moyou and even though it is softer than the Essence and definitely stickier it is exactly the same in in every other aspect. 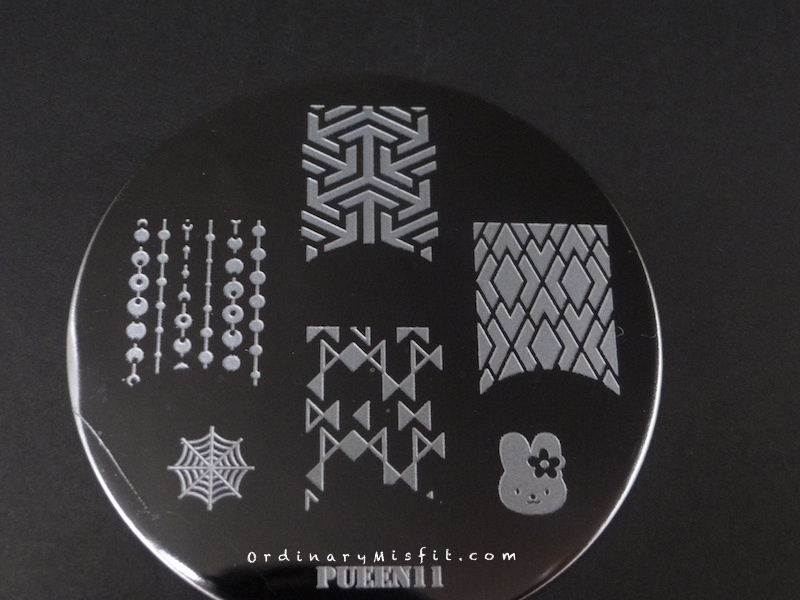 I then also got an XL squishy stamper which is bigger and softer than the other two. I have done a few tests to see if the different stampers react differently to the different polishes and I can’t see a difference yet so I am assuming it doesn’t. The only difference I can really see is the ease of use. If at any point I think it does I will let you know. For now I don’t think it matters which stamper I use to do these posts. Do you want me to mention which stamper I use anyway? Amethyst is a trooper huh. Thanks Kerry.